N Heptane Market Segmentation by Key Players Chevron Phillips Chemical Company, Haltermann Carless Deutschland GmbH, SK Global Chemical Co., Ltd., Exxon Mobil Corporation, Royal Dutch Shell Plc.,Sankyo Chemical Co. Ltd., Hanwha Total Petrochemical Company Limited and Gadiv Petrochemical Industries Ltd.
Persistence Market Research (PMR) provides an exclusive analysis of the global n-Heptane Market in its revised report titled “n-Heptane Market: Global Industry Analysis, 2013–2017 and Forecast, 2018 – 2026”. The main aim of this report is to offer an exhaustive analysis and insights pertaining to the n-Heptane market. This report offers a comprehensive analysis of the global n-Heptane market in terms of market volume (Tons) & value (US$ Mn) and year-wise (Y-o-Y) growth on the basis of purity, application and region. The report also sheds light on the dynamics prevailing in the n-Heptane market and provides key information pertaining to the several segments in the global n-Heptane market. To provide a better understanding and support stakeholders for decision making and market analysis, the report is incorporated with the analysis of drivers, restraints and trends that influence the current market scenario and are expected to impact the global n-Heptane market over the forecast period. The study provides data for 2017 along with an inclusive market forecast for the period 2018–2026. To understand and determine market opportunities and trends, the global n-Heptane market report has been categorically split into different sections based on purity type, application and region. The report begins with the market overview and provides market definition and taxonomy along with value chain, drivers & pricing analysis pertaining to the market. Following this, the n-Heptane market background is covered, which includes the factors affecting the n-Heptane market such as macro-economic factors, i.e. region-wise chemical sales and the outlook of various industries. The macro-economic factors include global statistics of the pharmaceutical industry overview, overview of the global solvents market, paints and coatings industry and chemical sales overview. The market background also covers the market dynamics that affect the n-Heptane market. The dynamics covered in the report are drivers, restraints, and trends. The market background also includes the value chain analysis wherein the flow of n-Heptane from the raw material supplier to the n-Heptane manufacturer to the end user through various distributors and retailers involved has been covered. The final part in the market background is the forecast factors, which include the factors that are expected to have an impact on the global n-Heptane market such as regulations on n-Heptane and physico-chemical properties. The sections that follow include the global n-Heptane market analysis – by purity type, by application and by region/country. All the above sections evaluate the market on the basis of various factors affecting the market. Each section discusses the qualitative and quantitative aspects of the global n-Heptane market. To give a brief idea about revenue opportunities from the application, purity type and region/country-wise segments, the report also provides market value (US$ Mn) data, growth rates, market shares and total incremental $ opportunity indices for each segment over the forecast period (2018–2026). In the final section of the report, we have provided a detailed competition landscape with company market share and performance in order to provide report audiences with a dashboard view of key players operating in the global n-Heptane market along with their business strategies. This would enable clients to assess strategies deployed by market leaders and help them develop effective strategies accordingly. For market data analysis, we have considered 2017 as the base year with market numbers estimated for 2018 and forecasts made for 2018–2026. To determine the market, we have tracked down the production of key players such Chevron Phillips Chemical Company and Hanwha Total. The PMR assessment is based on a multipronged approach that comprises secondary and primary research and triangulation of data obtained therefrom. During the initial phase of research work, product mapping was done, in which the types of products offered by major players with respect to application area were identified. Further, in secondary research, data available in public domains such as industry association, company annual reports, white papers, publications, journals and government sites, among other sources was collected and accordingly, a set of data points were built. For the same, a top-down approach has been used to assess market numbers for each type and a bottom-up approach has been used to counter validate the market estimation. For forecast assessment, forecast growth of end use sectors such as pharmaceuticals, paints & coatings industries and other factors affecting the consumption of n-Heptane have been considered. The forecast presented in the report evaluates the actual market size (US$ Mn) in 2017 with regard to n-Heptane and the expected market value in the global n-Heptane market over the forecast period. We have also analyzed the different segments of the global n-Heptane market in terms of Basis Point Share (BPS) to understand individual segments’ relative contribution to market growth. This detailed level of information is important for identifying various key trends governing the global n-Heptane market. The report also analyses the global n-Heptane market based on the incremental $ opportunity & global absolute $ opportunity. This is usually overlooked while estimating the market forecast; however, from a business development perspective, it is essential to identify the market attractiveness in terms of three indices, viz. market share index, CAGR index and incremental $ opportunity index, to identify the high potential resources in the n-Heptane market. Moreover, the market attractiveness index will help readers understand the key segments in terms of their performance and growth in the global n-Heptane market. This market attractiveness index would also help clients identify real opportunities in the global n-Heptane market. The report covers inclusive information about market trends, volume (Tons) and value (US$ Mn) forecasts, market dynamics, competition and recent developments in the global N-Heptane market for the study period 2018 to 2026.
n-Heptane is a straight chain organic compound that belongs to the alkane hydrocarbon family. It is a colorless liquid with typical petroleum odor and a volatile organic compound. n-Heptane is a non-polar solvent that is widely used in several industries such as pharmaceuticals, paints & coatings, electronics, polymer & plastic, adhesives & sealants, textile and industrial cleaning, among others. It is also used as a test fuel component in anti-knock engine testing. n-Heptane is mainly classified on the basis of purity into <95%, 95-99% and ≥99%. It is also used in niche applications such as catalyst preparation, chromatography and other lab scale operations. The global n-Heptane market is expected to witness significant growth during the forecast period, mainly driven by the rapid growth of pharmaceutical and paints & coating industries. The increasing consumption of electronic goods due to the rising disposable income and higher standards of living is expected to surge the demand for n-Heptane. Growing automotive production and increasing building & construction activities are collectively fueling the growth of the paints & coating industry, which in turn is driving the n-Heptane market. Growth of the pharmaceutical industry is increasing the demand for high purity n-Heptane market. 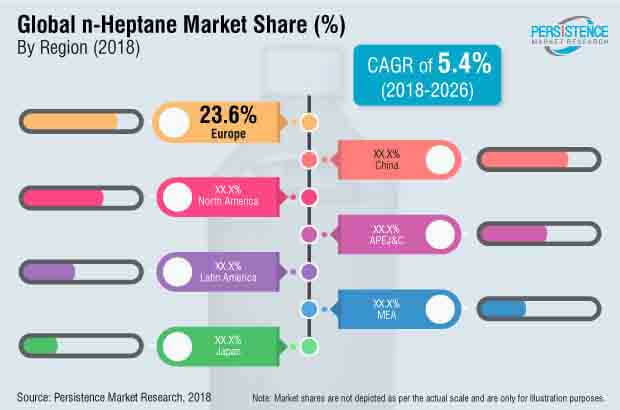 The rising demand from other industries such as plastic & polymer and adhesives & sealants is also positively impacting the growth of the n-Heptane market. The growing number of regulations on solvents such as aromatic solvents are driving the demand for n-Heptane. Rising production capacity and increasing efficiency of plants are also boosting the n-Heptane market. On the basis of country/region, China is expected to dominate the global n-Heptane market over the forecast period. The growth of end use industries in China is expected to drive the growth of the n-Heptane market in the country. The Asia Pacific Excluding Japan & China region is expected to witness lucrative growth over the forecast period, driven by countries such as India & South Korea. North America and Europe are estimated to be matured markets for n-Heptane and are thus expected to witness sluggish growth over the forecast period. The increasing construction activities, owing to urbanization in Latin America, are expected to mark Latin America as a growing market for n-Heptane. Exxon Mobil Corporation, Haltermann Carless Deutschland GmbH, Hanwha Total Petrochemical Company Limited, Chevron Phillips Chemical Company, Royal Dutch Shell Plc., SK Global Chemical Co., Ltd. and Sankyo Chemical Co. Ltd., among others. How has the n-Heptane market evolved in the past four years? What shape is the n-Heptane market expected to take in terms of volume and value during the study period? What are some of the prevailing market dynamics in the n-Heptane market? What are the competition developments and trends in n-Heptane market? What are some of the underlying macro-economic and industry factors impacting the growth of the n-Heptane market?